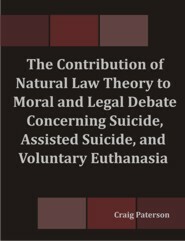 Chapter one argues for the important contribution that a natural law based framework can make towards an analysis and assessment of key controversies surrounding the practices of suicide, assisted suicide, and voluntary euthanasia. The second chapter considers a number of historical contributions to the debate. The third chapter takes up the modern context of ideas that have increasingly come to the fore in shaping the 'push' for reform. Particular areas focused upon include the value of human life, the value of personal autonomy, and the rejection of double effect reasoning. Chapter four engages in the task of pointing out structural weakness in utilitarianism and deontology. The thesis argues that major systemic weaknesses in both approaches can be overcome by a teleology of basic human goods. John Finnis' work becomes the underpinning of subsequent applied natural law analysis. Chapter five proceeds to argue for the defence of the intrinsic good of human life from direct attack. The thesis holds out for the proposition "that it is always a serious moral wrong to intentionally kill a human person, whether self or another, regardless of a further appeal to consequences or motive." In support of this, it defends the validity of double effect reasoning as an indispensable part of applied moral decision making. Chapter six critically assesses the arguments of anti-perfectionists that it is not the business of the state to enforce deep or substantive conceptions of the 'good life.' The chapter moves on to argue that the natural law conception of the person in society, centred on the common good, provides a solid framework for assessing both the justification for, as well as the limits on, the role of the state to use its power to legally impose certain moral standards. Chapter seven addresses the concrete relationship between natural law and legal policy by exploring the issue of assisted suicide in the constitutional context of the United States.